← Please sir, can I have S’mores? A long, long, long time ago, or approximately a week before Sophie the Wonder Dog arrived at our house (who didn’t know 6-week-old puppies were this much trouble? Just me? Fine. ), we had the family over for the first brats-and-burgers cookout of the Spring season. 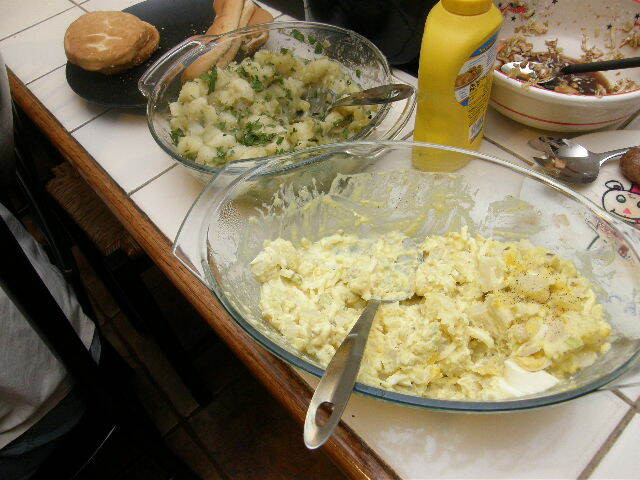 Preparing for this event, I realized that I had never before made potato salad. Imagine that! It’s a staple at practically every picnic or BBQ ever held in the Midwest, and I’ve eaten it countless times. I can’t ever remember seeing my Mom make it, although I’m guessing she did. In my adult life, it’s always been something that comes in a plastic container you get from the Deli counter at the grocery store. So, I went to the InterWebs and found two recipes that looked interesting. The first one is a SouthWestern take on the dish and I think it sounds much more attractive in Spanish, Ensalada Verde de Patatas (Green Potato Salad). 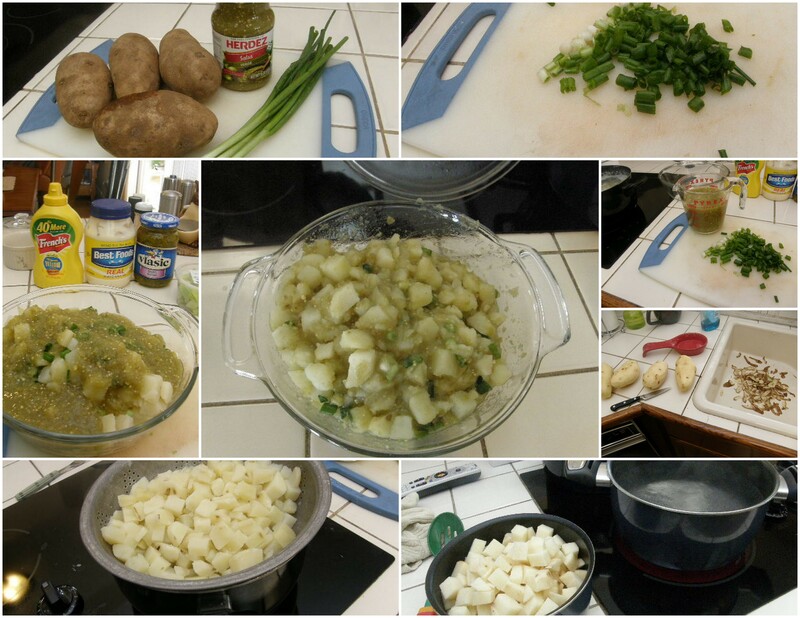 The recipe originally called for three ingredients; potatoes, salsa verde, and scallions. I added chopped cilantro to the mix because it seemed like the right thing to do. I was correct. 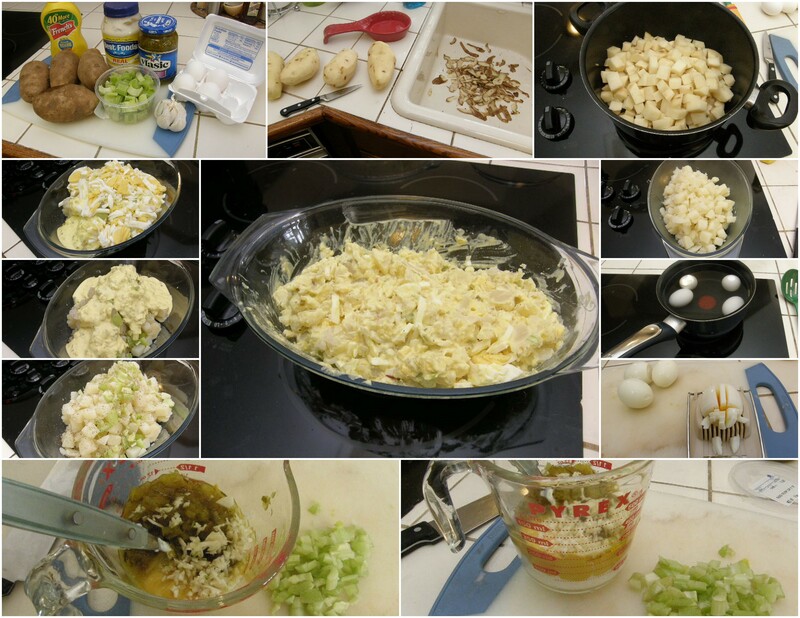 The second recipe is what I consider to be a traditional potato salad (which really just means *my* traditional potato salad) made with potatoes, celery, hard-boiled eggs and a dressing that combines sweet pickle relish, mayonnaise, and mustard (with some minced garlic for extra kick). As with almost everything I make for the first time, I learned a couple of things making these. First was how you should consider the potatoes “done” just before they are easily pierced with a fork. They’ll still cook slightly while draining and drying, and getting them out a little early will prevent them from being mushy in the salad (although worst case, mushy homemade potato salad still rocks). The other thing I learned (and I’ve “learned” this a bunch of times with just about everything I’ve ever made) is that anything homemade is WAY BETTER than its store-bought counterpart. Really, the difference in flavor is so large that I doubt I’ll ever serve store-bought potato salad again. Why would you? Making it at home is easy and the results are awesome, well worth the little time and effort it takes. How many partially consumed tubs of store-bought potato salad have you thrown away? You won’t have leftovers of your homemade salad. Place prepared potatoes into a large pot of salted, boiling water and cook until just tender, about 12 minutes. Drain in a colander and return potatoes in the colander to the hot pot to further drain and dry as you prepare the remaining ingredients. Chop scallions and mince cilantro. In a serving bowl, combine cilantro, scallions, potatoes, and salsa. Serve warm, or chilled. Place prepared potatoes into a large pot of salted, boiling water and cook until just tender, about 12 minutes. Drain in a colander and return potatoes in the colander to the hot pot to further drain and dry for 2 minutes or so. In a serving bowl, combine all ingredients and mix gently to combine. Serve warm, or chilled. Rating: It’s hard to tell from this picture, but the audience voted early and often in favor of the Southern Potato Salad, much to my dismay. My personal favorite was the Ensalada Verde. The Southern definitely gets a 5 out of 5 glasses of lager (which also goes well with the brats and burgers). I’ll give the Ensalada Verde a 4 out of 5 and try and get the potatoes a little less well done the next time. Try them both and free up space in the grocery Deli case for important things like smoked salmon! This entry was posted in 5 Wine Glasses, Dinner, Lunch, Side Dish, Vegetarian. Bookmark the permalink. If you never posted another recipe ever again, and only posted photos of Sophie, I’d be totally OK with that. Not that you don’t make amazing food, you do (hello cherry tomatoes! ), it’s just that dog is so damn cute. New blog, “Wine and a Puppy”?